The NMCI, in conjunction with Cork Education & Training Board, are delighted to announce that we have a new course offering – “Gateway to Cruise Line & Ferry Industry”. If you are looking for something different then a career within the cruise line industry may be just for you. Positions in demand can vary greatly from hospitality, to beauticians, hairdressers, receptionists, personal trainers, childcare workers, security/ administration personnel to EI Technicians. I am really interesting about this course. 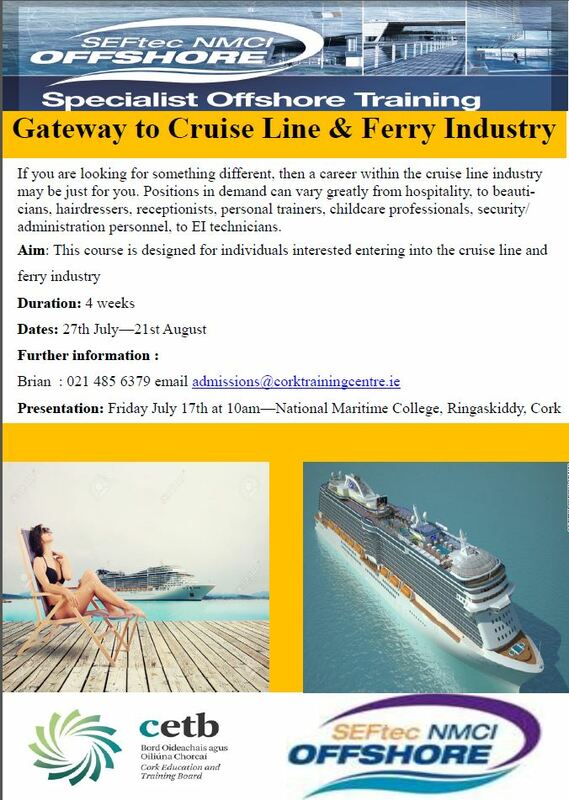 Hi John, We will be holding a presentation on the Gateway to Cruise Line & Ferry Industry Course on July 17th here at the National Maritime College of Ireland. If you wish I can ring you and give you some more details?